This review has not yet been approved by the owner of this writing service. If you are the webmaster of Academicwritinghelp.com, please Contact Us to approve or remove this review. It is a case of a designer being overwhelmed by his possibilities. Everything moves, flickers, floats, appears and disappears randomly, without any order or logic. At first you like this torrent of attention, five minutes later it annoys you, and in half an hour you wish to kill the one who designed it all. However, all the necessary information is easy to find. Prices are more or less average, not extremely high, not overwhelmingly low. 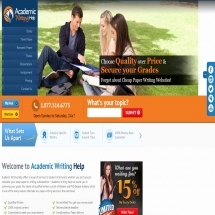 Essay-writing, for example, costs from $15.95 to $49.95; and I think that these prices are completely justified, because they take into account the deadline and academic level. Higher tier writing, however, looks a little bit cheaper than one would expect. Some other assignments cost differently, but the general principle is the same. Chat: the operators are friendly, well-informed and quick to answer. It was a real pleasure dealing with them. There are also phone and e-mail. Either way, you get your answers quickly and in full detail. Service offers 10% additional discount if you find another site offering the same additional features. UK writers are available at no extra cost. It is one of the services you want to love but cannot, unfortunately. Yes, it has a correct idea about attracting customers and winning their loyalty by growing discounts and rewards; but gosh, this website is annoying!